Science never makes an advance until philosophy authorizes it to do so. Essay on Freud (1937). Quoted in Charles W. Misner, Kip S. Thorne and John Archibald Wheeler, Gravitation (1973), 1208. The first difficulty of all is the production of a lamp which shall be thoroughly reliable, and neither complicated nor expensive. All attempts up to the present lamp in this direction are acknowledged to be failures, and, as I have pointed out, there does not seem to be any novelty such as would authorize us to hope for a better success in the present one. Truth travels down from the heights of philosophy to the humblest walks of life, and up from the simplest perceptions of an awakened intellect to the discoveries which almost change the face of the world. At every stage of its progress it is genial, luminous, creative. When first struck out by some distinguished and fortunate genius, it may address itself only to a few minds of kindred power. It exists then only in the highest forms of science; it corrects former systems, and authorizes new generalizations. Discussion, controversy begins; more truth is elicited, more errors exploded, more doubts cleared up, more phenomena drawn into the circle, unexpected connexions of kindred sciences are traced, and in each step of the progress, the number rapidly grows of those who are prepared to comprehend and carry on some branches of the investigation,— till, in the lapse of time, every order of intellect has been kindled, from that of the sublime discoverer to the practical machinist; and every department of knowledge been enlarged, from the most abstruse and transcendental theory to the daily arts of life. In An Address Delivered Before the Literary Societies of Amherst College (25 Aug 1835), 16-17. With respect to those who may ask why Nature does not produce new beings? We may enquire of them in turn, upon what foundation they suppose this fact? What it is that authorizes them to believe this sterility in Nature? Know they if, in the various combinations which she is every instant forming, Nature be not occupied in producing new beings, without the cognizance of these observers? Who has informed them that this Nature is not actually assembling, in her immense elaboratory, the elements suitable to bring to light, generations entirely new, that will have nothing in common with those of the species at present existing? What absurdity then, or what want of just inference would there be, to imagine that the man, the horse, the fish, the bird will be no more? Are these animals so indispensably requisite to Nature, that without them she cannot continue her eternal course? Does not all change around us? Do we not ourselves change? ... 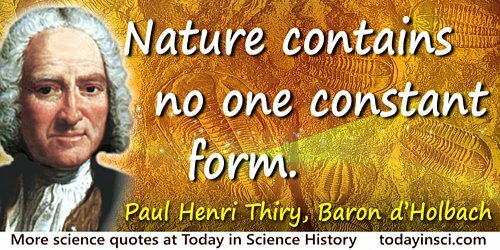 Nature contains no one constant form. The System of Nature (1770), trans. Samuel Wilkinson (1820), Vol. 1, 94-95.